November to late march. During winter, conditions can be very harsh and daylight short. Puerto Williams is the main town in Navarino island, which is located south of the Beagle channel. A plane from Punta Arenas: Aerovías DAP do every day a round trip in a Twin Otter DHC-6, for 20 passengers. The flight takes less than an hour and it passes over the spectacular Cordillera de Darwin if it is clear. Check prices and schedules at Aerolíneas DAP , or calling 56-61-616100. Boat from Punta Arenas: Transbordadora Austral Broom does a weekly round trip to Puerto Williams. It takes 34 hours on the big Bahía Azul ferry. It is quite an experience to navigate on the southern channels and fjords, admiring several hanging glaciers that reach the Beagle channel from Cordillera de Darwin. Check prices and schedules at Tabsa, or calling 56-61-218100 - 218. A plane from Ushuaia: It is possible, thogh expensive, to chart a plane. Likewise, the French system has been complemented by a series of numbers inscribed along with some of the painted markers throughout the trail. In this sense, out of a total of 395 markers, 38 (known as GUIDEPOST, abbreviated form of Numerical System for Points of Special Interest) have been singled out. GUIDEPOSTs are Arabic numbers that periodically accompany the regular route and direction markers; each has its own meaning, which is explained in the topoguide. Chapter Two provides an orderly listing of the GUIDEPOSTs according to the 5 trail segments that describe in both written and photographic form, among other aspects, the heading to follow, trip duration, camping spots, dangerous locations, geographical names (toponymy), and the trail's general features. Trailmarking direction: Trailmarking is unidirectional, with the starting point in the vicinity of the waterfall (GUIDEPOST nº1), and the end near Virginia Bay, by the MacLean fish company (GUIDEPOST nº38). 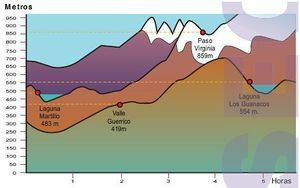 It is possible to travel the route backwards, following the topoguide's description and pictures from end to beginning, but be warned, in doing so, you will find yourself faced with two very steep slopes that are easier to go down than up. Earlier markers: In the forest near the waterfall (segment 1 of the trail), you will find old markings on the trees. The markings are so unaesthetic, anarchic, and erratic that they end up confusing the hiker. So, an absolute minimum number of markers were placed in order to not continue overloading the forest with signs. 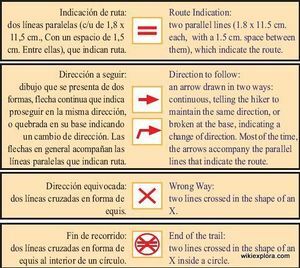 If you have any trouble following our markers, turn to the topoguide for indications and to the layout of the path on the ground. Puerto Williams. Leave town by the road heading west. After about 1 kilometer, you will find "Plaza de la Virgen." Follow the road on the left and walk south for 45 minutes, zigzagging through the hills among forests and peat bogs. You will find the beginning of the trail at the end of the road, next to a waterfall and the dam. Take the path that goes toward the woods indicated by GUIDEPOST N° 1; it runs parallel to the river course, above the bank. Don't take the path that follows the river, nor the one that goes east. Hike through the forest for 10 minutes, then the path abruptly turns east (GUIDEPOST N° 2), and goes toward the side of the hill. Follow it, always heading towards the steep slope. After leaving the forest (GUIDEPOST N° 3), stay on the path, keeping the stakes in sight, until reaching the low peak of Cerro Bandera (stone landmark and GUIDEPOST N° 4). Be careful not to step on the low, dense, and hard green plant formations. Head 230° and follow the stakes. 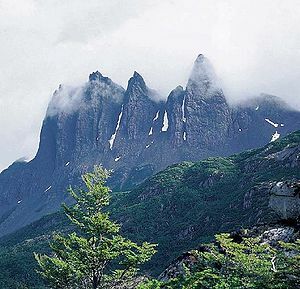 After a 10-minute walk from the low peak, on the right (west) you will find the high peak of Cerro Bandera (GUIDEPOST N° 5). Without climbing towards GUIDEPOST N°5, go 180° and follow the stone landmarks, passing the next hill on the left. In the event of reduced visibility, be careful to guide yourself by the arrows drawn on the landmarks. Farther ahead you will find GUIDEPOST N° 6, that marks a small river crossing, from where you should bear 230° following the stone landmarks. Walk for an hour and a half by the foothill or hillside, making sure to project an imaginary route that is closer to the tree line than to the ridgeline (GUIDEPOST N° 7 and 8). The foothills route will take you above Laguna del Salto (GUIDEPOST N° 9). There you should turn right, and climb down a steep slope toward the lagoon. Be careful to study the pictures ahead of time as they indicate with asterisks the direction to take in going downslope. 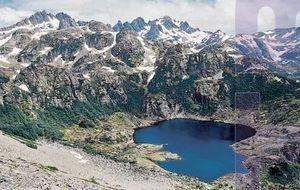 Carefully descend in the direction of a large dark rock, on top of which you will find GUIDEPOST N° 10, located about 40 meters away from the Laguna del Salto shore. End of first segment. 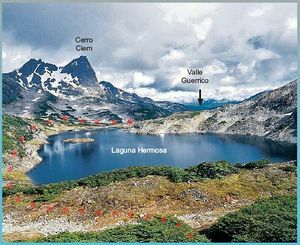 Circle Laguna del Salto on the left (east). To the south of the lagoon, a knoll (rocky promontory) drops sharply to the shore; at its base lie big rocks under the water. Climb before the knoll, immediately to the left of this (GUIDEPOST N° 11), following the creek closest to the rocky promontory that runs by a steep-sided gulch. Continue for the length of the gulch until crossing the knoll's peak. Then turn left (east) and follow the natural course of a small winding valley that extends up to a wide plain (GUIDEPOST N° 12). After crossing the river, climb to the right over a large hill covered with grass and peat moss that lies in the center of the plain. 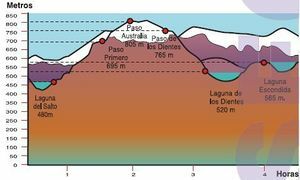 Follow the crest of the hill until arriving at a small, rocky pass - "Paso Primero" - from which you descend to a creek. 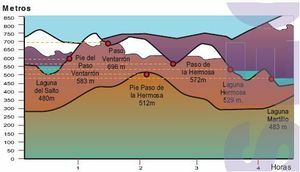 After Paso Primero, follow the course of the creek until reaching the entrance of the high valley (GUIDEPOST N° 13), where it is common to find snow, even in the summer. Follow the valley to the left (east), bearing 140°, until reaching Paso Australia (GUIDEPOST N° 14) marked by an important landmark of stones. Go to the right of the lagoon lying at the foot of Paso Australia without climbing down toward the lagoon. Follow the route situated in the middle of the foothill, bearing 110°. A dangerous pass, above all when the ground is wet or there are slabs of snow. Project an imaginary bearing while always keeping the markers in sight. Thus, you get to Paso de los Dientes that looks to the south (GUIDEPOST N° 15) Go down to the valley that opens up on the other side of the pass, going to the left of the lagoons. On the south shore of the third lagoon you will find GUIDEPOST N° 16. Turn to the right, bearing 240°, continue toward Laguna de los Dientes. On the east shore you will find GUIDEPOST N° 17. Circle it to the north until reaching its west shore (GUIDEPOST N° 18), up to the point where a valley opens up to the right. Follow it, bearing 290°, until arriving at Laguna Escondida where you will find GUIDEPOST N° 19 on the east shore. End of segment. For campsites, check the options offered by GUIDEPOSTs 16, 17, 19, and 20. Circle Laguna Escondida on the left, bearing south, and follow the river a short way. After a brief distance (GUIDEPOST N° 20), enter the valley that opens up to the right, bearing 210°. 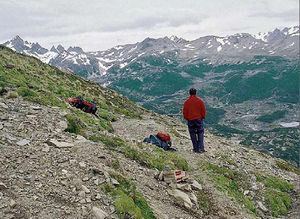 Paso Ventarrón is in view; project an imaginary bearing, veering toward the north slope, cross the shrub forest, and continue to nearly the end of the valley. On the left, at the foot of Paso Ventarrón you will find GUIDEPOST N° 21. From that location, you will be in front of a short, abrupt slope that leads to the pass. Once in the pass (GUIDEPOST N° 22), do not go down the other side or toward the foothill, continue climbing to the right (bearing west), for roughly 10 minutes before going down to the valley. Go down the right side of the valley to the foot of Paso Guerrico (GUIDEPOST N° 23). Climb up a short, steep hillside, bearing 230°, go through the middle of a small forest growing among large rocks, until reaching Paso Guerrico (GUIDEPOST N° 24). Circle Laguna Hermosa to the left until finding the outlet (GUIDEPOST N° 25). Travel north, zigzagging among the shrub forest, until reaching Laguna Martillo. On the south end, near the shore and on the edge of a small beaver dam (GUIDEPOST N° 26), you will find campsites. End of segment. Starting from the southeast shore of Laguna Martillo (GUIDEPOST N° 26), circle it on the right until reaching the peninsula that separates the main body of the lagoon from its northwest end. From there climb to the right (GUIDEPOST N° 27) to cut over this peninsula toward the north. Once back at the Laguna Martillo shore (GUIDEPOST N° 28), follow it WITHOUT ASCENDING to the right, until reaching the outlet. From there (GUIDEPOST N° 29), bear 330°, toward a white rock that stands out in the distance on the peak of a hill. After reaching this rock (GUIDEPOST N° 30), continue the same bearing (330°), and then go around the right shore of the narrow Laguna Rocallosa. Next to the water you will find an accumulation of large rocks over which you will have to cross. In maintaining this direction, you will reach a large white rock (GUIDEPOST N° 31) on the other side of Laguna Rocallosa. From this location, you will be able to see Paso Virginia to the north. This is the best possible point for observing the road to get up to the pass: from here set an imaginary line marking the direction; this should unite a clearing in the lower part of the forest with the peak of a small denuded cliff, then another clearing in the upper part of the forest, and finally the base of the pass that stands out due to a depression in the ridgeline. To reach the first forest clearing from GUIDEPOST N° 31, keep walking, going to the right of the next lagoon, until reaching a rock hill (GUIDEPOST N° 32). Turn to the right i a small clearing inside the woods and climb in a straight line until reaching the small denuded cliff mentioned above. Climb it, veering to the left, this way you should reach a creek located in the lower part of Paso Virginia (GUIDEPOST Nº 33). 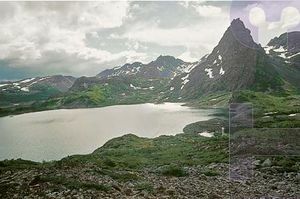 From here bear 30°, passing by the right of the creek, then continue upward among the small lagoons that are sometimes formed, until arriving at the pass (GUIDEPOST N° 34). CAREFUL! 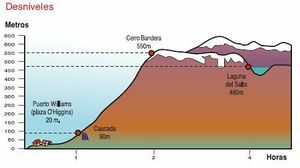 If you go beyond the stone pyramid, that GUIDEPOST Nº 34 indicates, to admire the beautiful view of Laguna del Guanaco and the Beagle Channel, you should consider that the edge is an unstable snow ledge hanging over a 300 meter-high cliff. Also, violent and unpredictable wind blasts are a common occurrence in the whole area; they can knock you off your feet and drag you downhill. From GUIDEPOST Nº 34, turn to the right and continue a short distance to go around the ledge, then take the foothill to the left, which leads to a group of black stones that stick out. Carefully follow the markers through the foothill, they cross a very steep slope. Then, turn to the left and go down the steep slope to the area near Laguna Los Guanacos. 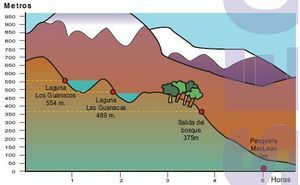 Follow the Guanaco path on the west shore up to the outlet (GUIDEPOST N° 35). From the Los Guanacos lagoon outlet to the left of the river, at the start moving away from it toward a pasture and then, coming closer to continue toward the forest. 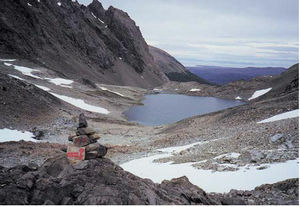 At the exit of the forest go down the gulch, following the course of a creek until arriving at Laguna de Las Guanacas (GUIDEPOST N° 36). End of segment, for a camp spot check the options on GUIDEPOSTs 35 and 36. From GUIDEPOST Nº 36 go around Laguna Las Guanacas on the right; slightly before reaching the outlet, turn toward the forest. Continue on through the forest, descending toward a terrace with a lagoon in the center. Go around it on the right up to halfway, there look again to the right for the path that goes into a beaver-damaged forest. Then cross through a high forest; from there, the path tends to go north and follows the foothill on the right of the valley, going down toward the end of it (GUIDEPOST N° 37). Farther ahead, you should go around several beaver ponds and cross some patches of woods that are at the foot of a rocky cliff. Then, at the beginning of the slope covered with grass and Calafate underbrush that faces the Beagle Channel, you will see a conspicuous dry tree trunk: a marker has been placed on it indicating the end of the markers and the heading to follow (GUIDEPOST N° 38). From there on, zigzag down through the Calafate underbrush looking for the coast and the visible buildings of Pesquera MacLean. When you get to the fish factory, follow the road to the east for 8 kilometers, in about two hours you will reach the city of Puerto Williams. End of circuit.